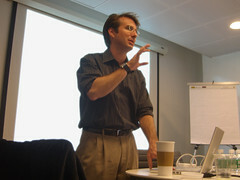 A couple weeks ago I brought Eric Miller (of Zepheira and W3C, among other things) into my office to lead a workshop on the Semantic Web. Many of my colleagues are interested in the subject, but with varying levels of familiarity. And none of us are really sure what to do with it yet. My goal in organizing this workshop was to activate and deepen our group’s knowledge, excitement and involvement, vis a vis the semantic web. For a good five hours we listened and discussed, as Eric gave us some background, presented case studies, told anecdotes and responded to our questions. The information was great, and the inspiration was even more valuable. Eric combines deep knowledge with a keen business sense. He’s able to be visionary while keeping it all in perspective. This is not always true of the brilliant people I’ve met in this industry. The workshop was a great success. The people who’ve talked to me about it seemed to find it very stimulating and thought provoking. It didn’t occur to me until later that Eric Miller was observing us as much as we were observing him. I got the impression that he approved. I’m not saying he’s endorsing us, just that he seemed impressed with the questions people asked, and encouraged by our insight and enthusiasm. I’m keenly optimistic about all this. There’s a lot of potential in the semantic web, and some of the emerging technologies are pretty incredible. But something has to bridge the gap between where we are now and the ubiquitous adoption described in Sir Tim Berners-Lee’s vision. Actually, I’m not convinced that this vision is meant to be prognostication. I see it more as a story Berners-Lee tells to help people imagine something that’s so far outside their realm of experience, it’s virtually unimaginable. It’s the futuretech version of a parable. Even if we don’t take the story literally, we still have a long way to go. Semantic Technologies have become mature enough to start addressing the challenges of scalability and overcoming the hurdles of implementation. Elegant well-packaged solutions are becoming available, and consulting services have knowledgeable, experienced staff to help integrate these solutions. What kind of obstacles remain? Frankly, the details of semantic data frameworks are kind of intimidating to most people who aren’t early adopters. The only way to really overcome this barrier is to hide the complexity. This is where I think innovative web design agencies, like the one I work for, can contribute. Add usability expertise and user-centered design to semantic web solutions, then create products that individuals, businesses, and organizations can use to solve real problems, and people will use them without ever having to wonder what “ontology” means. Then we can move beyond the science fiction allegory and into a reality where the Web of Data becomes as integral as looking at Facebook every hour to check your friends’ status. I don’t mean to make this sound like I’m saying “it’s as simple as that!” The design challenges are are going to be very challenging. How do you design a site, or a UI, around a dynamic, evolving, unpredictable set of data? I don’t know the answer, but at Avenue A | Razorfish I’m going to take advantage of the supportive, innovation-oriented environment and engage the bright, creative minds of my coworkers to tackle the problem. we have been investigating precisely the kinds of questions you ask at the end of this post, both for Semantic Web and for “regular” Web applications. We have built an environment called HyperDE, that is based on Ruby on Rails, but works with RDF data instead of relational data. It also includes additional abstractions to help deal with navigation and interface issues. This enviroment is freely available for download at http://www.tecweb.inf.puc-rio.br/hyperde. It is based on a design methodology called OOHDM (and its Semantic Web version, SHDM), which you can read more about at http://www.tecweb.inf.puc-rio.br/oohdm.